Not sure if drop bars are original as it isn’t shown as so in catalog I’m guessing it’s 1975. The rear derailleur despite cleaning is pretty stiff. It is a simplex. Any compatible upgrades? I do no wish to change front derailleur at this time. I will also upgrade brake levers as it has the suicide ones on it. Can’t blame you! Those 1970s Peugeots are nice. The common choice for a replacement derailleur is to find an older Suntour V-GT or V-GT Luxe long cage derailleur. Suntour continued to develop those derailleurs and they got better and lighter, so you could get just about any of them up through the Cyclone models. For my Peugeots I prefer Huret Duopars but those are pricy. You can often just unscrew the suicide levers and leave the rest of the brake lever alone. There will be a stud sticking out from the lever body, but they can be easily cut off with a hacksaw. Then you can cover the lever with a rubber boot and no one would know that they ever had suicide levers. I have to say that I have become a very big fan of the snappy shifting performance that a free-moving Simplex Prestige derailer can offer, so I will suggest soaking your derailer in warmed motor oil as a near-guarantee of restored freedom of movement. I heat to 160F then just let it cool and soak for a day, then remove the derailer and allow it to rest on a thick rag for a day in a warm place. The downside to these derailers seems to be their fragile pulleys, which use 6mm bolts and so are only compatible with the much stronger Suntour or Huret pulleys used as replacements. So the Suntour derailer is also a really solid choice, just not original. Your "suicide" or "turkey wing" levers are a good thing mounted to Mafac levers, since the Mafac levers have an almost too-long reach and lever throw (the turkey wings shorten the reach quite a bit but still leave plenty of throw, unlike when installed on Weinmann levers). These particular pivot pins are a somewhat rare/valuable item for those looking to add turkey wings to Mafac levers, so I would consider not cutting them off. It's great that the original lever hoods are still there, since they are relatively costly to replace. If this bike fits you well you have a real good bike there. Did you see the Thread: 'Peugeot Head Badge Timeline' also in 'Classic & Vintage'. You've got the nice plastic with metal badge, so it could be a bike from 1977.
by the way, the bike looks super. shiny chrome and all that rubber stuff on the levers. Bicycle Research Products is one maker who offered a set of adaptor pins to fit the DC extension levers to MAFAC drop bar levers. 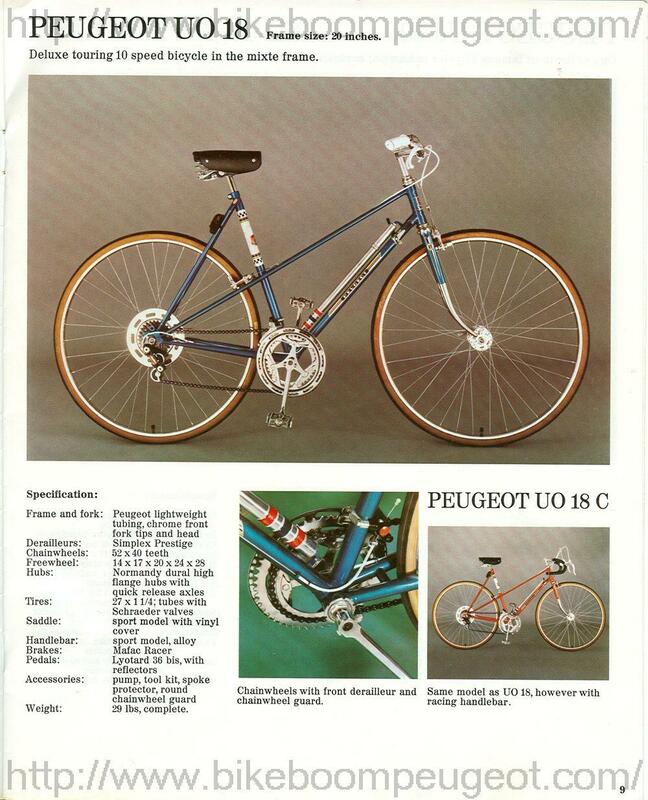 Another was ACS (American Cycle Systems). I'll agree with @dddd here and vote for keeping the Prestige, if you can. However nice those Suntour derailleurs are, that bike really wants a Simplex. I vote for keeping the simplex. That bike is just crying out for one. It should not feel stiff. If it feels stiff, it just needs to be properly lubed. Also, almost certainly the cable needs to be pulled and greased. That's probably where most of the stiffness comes from. There was no teflon lining then. Shift levers could probably use a cleaning and a light wipe of grease too. After a few decades, old grease turns into something akin to parmesan cheese. Oh, the chain probably should be cleaned and oiled. (If you have it, or put a new SRAM on there) Get all that set up, and that drivetrain will shift just fine. 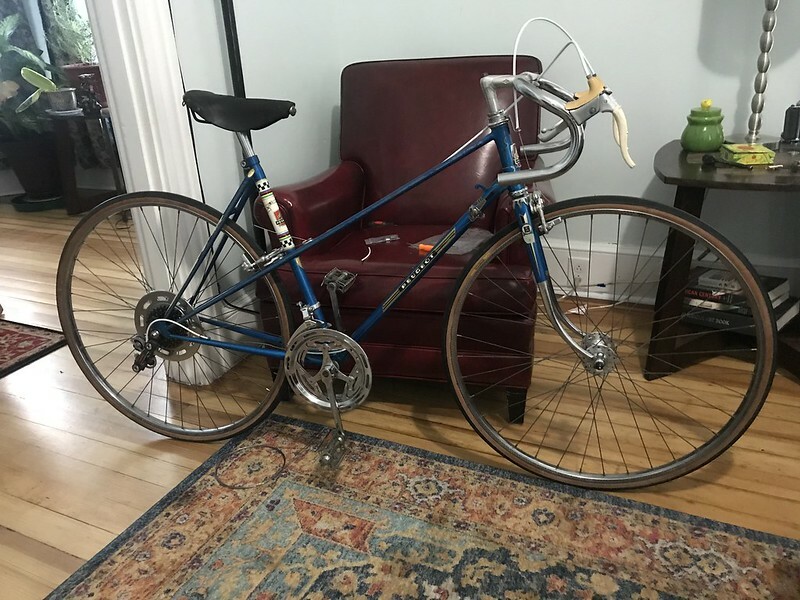 IMO some nice 3 speed type bars would be appropriate for that bike. SOMA sparrow or something like that. Worth considering. Mixte frames and dropped bars never made sense really. It was just the trend at the time. To be a basic rider, looks like it just needs the usual consumables: tires, tubes, cables, grease, oil, chain, brake pads. Aluminum rims would be the obvious upgrade, but that's a commitment. Not really necessary unless it's going on long rides, or if riding up long hills. They will brake better and feel lighter. 1. Drop bars look great on mixtes, as long as the frame is not too long for the rider. 2. Aluminum rims, though a major commitment, are a must, as are KoolStop brake pads. 3. Nothing wrong with SunTour derailleurs on a French bike -- Motobecane did it all the time. 4. Unless you have hands like Sergei Rachmaninoff's, Weinmann brake handles are much safer than Mafacs. Good thing, I left turkey wings on. I did attempt to remove one of them and realized it would not be possible bc of the bolt. Uhm Weinmann brakes I could find plenty of those in my basement. Now I get why you take a bike apart for parts  I also do have a Suntour derailleur that would fit it but I opted to just take it apart and clean it. It was fun and puzzling but I think it’s way improved! Thank you all for the input, hoping to take it for a ride this weekend. Changed all cables as well. Everything is moving well. I ve had chain soaking on wd after a quick clean. That was going to be my next suggestion. Can't believe someone didn't mention it already. As others above, my experience is when the rear shifting is balky, the fault is never in the rear derailleur, but in the cables, or (sometimes) in the shifters. A well-oiled Simplex Prestige moves as easily as anything out there. Thanks for the contrary opinion! I will desist from making that recommendation again for Mafac levers. Fortunately, I have only removed the turkey levers from DiaCompe and Weismann brakes in the past. Left to do putting chain and bar tape. Agree with John on both. I would add that you probably want to play with bar position to see what you like best for fit and aesthetics. Try leveling the top of the bar for example. Perfect time to do it before bar tape. Also, you will thank yourself for finding aluminum alloy rims. I’m guessing you have 27”? If so, you might even consider going to 700c. I did on an old Ross and i can now stop in the rain. The front brakes seem to have enough adjustment for the the 4mm smaller diameter. Rear looks to be tight. But 700c would open up your world to so many tire options. If you have a co-op around, you may well find some French wheels. Just pay attention to the freewheel threading, but you probably already know that. Put a few miles on it before taping the bars. It's a personal thing, but I like to rotate my drop bars a bit anticlockwise when viewed from the drive side, so that the flat bottom part points slightly downward towards the rear axle, instead of being horizontal. The also makes the top of the drop curve more horizontal and comfortable, but it may affect the position of your brake handles along the curve. oh cool, i'll look at it tonight. Practice makes perfect, but she looks great. II love how this style of mixte connects the sloping TT to the rear dropout. It allows for a very straight cable run to the rear center pull brakes. I’m not a fan of bottom side pulls as they have such an awkward cable loop. It’s a bit more tuning, but looks very elegant. Steel rims are terrible when they are wet. Aluminum rims will brake much, much better. Also, the Kool Stop salmon brake pads help. Both, but mostly the steel rims. I remember the first time I rode my Ross (steel rims) in the rain and (trying) to stop at an intersection. My life started flashing before my eyes as I kept right on going. Fortunately there weren’t many cars and I did actually stop before going through, but I did have to peel my fingers off of the handlebars from the death grip needed to stop. I learned to start braking well in advance when it was wet out. New pads helped, but alloy rims made the biggest difference.